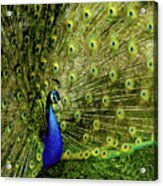 Queen duvet cover (88" x 88") featuring the image "Peacock At Frankenmuth Michigan" by LeeAnn McLaneGoetz McLaneGoetzStudioLLCcom. Our soft microfiber duvet covers are hand sewn and include a hidden zipper for easy washing and assembly. Your selected image is printed on the top surface with a soft white surface underneath. All duvet covers are machine washable with cold water and a mild detergent. Lesa - Thank you so much. It always is a pleasure to do what you love. LeeAnn, I am so impressed by your work. 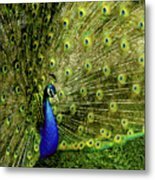 I love peacocks and peafowl. And birds, and just about everything else you photograph. You truly have an exceptional eye, wonderful composition, and heart. Peafowl are flying birds in the genus Pavo of the pheasant family, best known for the male's extravagant eye-spotted tail, which it displays as part of courtship. The male is called a peacock, the female a peahen, and the offspring peachicks. The adult female peafowl is grey and/or brown. Peachicks can be between yellow and a tawny colour with darker brown patches. 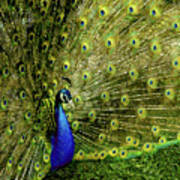 The male peacock has iridescent blue-green or green coloured plumage. The peacock tail ("train") is not the tail quill feathers but the highly elongated upper tail coverts. 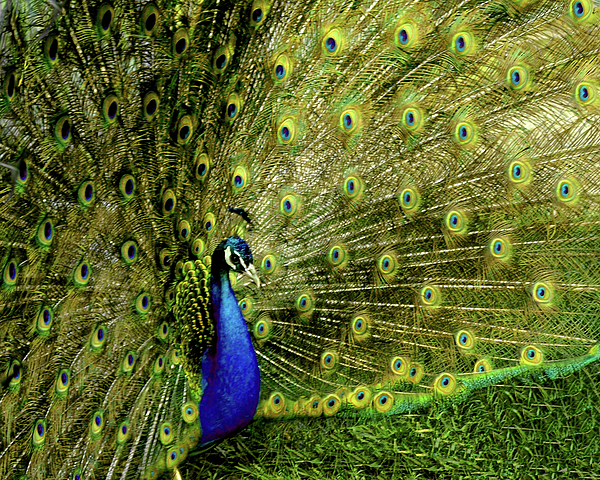 The "eyes" are best seen when the peacock fans its tail. Like a cupped hand behind the ear the erect tail-fan of the male helps direct sound to the ears. Both species have a crest atop the head. The female peahen has a mixture of dull green, brown, and grey in her plumage. She lacks the long upper tail coverts of the male but has a crest. The female can also display her plumage to ward off female competition or signal danger to her young.